The folks behind Capogiro UPenn's Twitter feed spotted my tweets about reviewing hot chocolate around Philadelphia and tweeted at us to suggest their own Italian Hot Chocolate. Glad they did, because a) I wouldn't have thought of going there for anything but gelato and b) the Italian HC ended up being great! I have traditionally shied away from the thicker, European style hot chocolate fearing it would taste like a liquid candy bar, but the version at Capogiro may have won me back over. I tried it at the 20th & Sansom location, whose rendition was just rich enough. I could also tell high quality chocolate was going into this drink, versus mass-produced syrup or powder (it is, after all, $4.00 so it better be good). As an extra perk, in addition to the just-larger-than-espresso cup of cocoa, you get a bonus mini pitcher with at least two more cupfuls to drink. It stayed really hot the entire time, too - just the thing to warm me up after holiday shopping. I have to warn you that the surface may not seem so hot, but it is very hot underneath so sip slowly to avoid a burned tongue. Finally, whipped cream automatically came on the side, just how I prefer it. While there, I also had a good tuna melt panini, which was a basic tuna and cheddar sandwich on yummy multi-grain bread. A few critical notes about location... First, the UPenn Capgiro people said they offer the Italian hot chocolate with booze in it, so consider that when choosing your destination. I'm told by others they have a decent bar, too. Who knew. 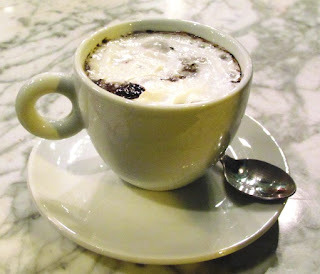 Second, not all Capogiro hot chocolates are alike. 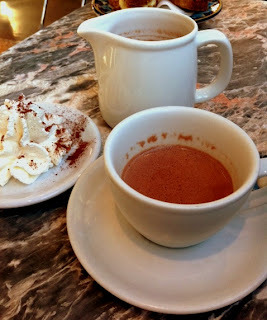 Bradd and I recently visited the Midtown Village location on 13th Street during a Foodspotting Hot Chocolate crawl and the results were not nearly as compelling. Two other crawlers ordered the Italian and one turned out mostly similar, but a little darker/thicker. The other, however, was literally liquid pudding. The barrista dude must have messed something up. I felt bad for influencing Brian from Bridges, Burgers & Beer to order it but I think the other guy's decent pour proved that Brian's was a fluke. Sorry, man! To be on the safe side, stick with 20th St. or go for the boozy option and report back to me. On that Foodspotting crawl we also tried the European Hot Chocolate at Philly Chocolate (13th & Walnut). It was also very good/hot, but not quite as good as the 20th Street Capogiro, nor did it come with a bonus pitcher of extra drink (though it was a similar price). I do, however, highly recommend these adorable and delicious chocolate-covered Oreo pops - one of the gazillion, fantastic-looking treats at Philly Chocolate. 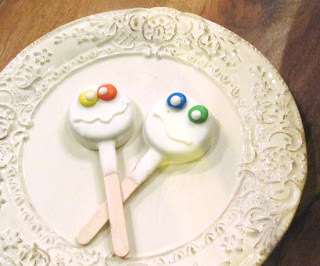 Love these little white-chocolate covered Oreo pops! Have you tried the Franklin Fountain's European Drinking Chocolate yet? Grant, I may be a little biased because I work there, but it really is awesome. I love those Oreo pops-- they're so cute! they have european drinking chocolate at franklin fountain?! i've gotta try that!